Prom is always a significant occasion for which one wants to look her absolute best. Styling your hair for prom might sound complicated but it is actually very easy. With a few guidelines and ideas, you can achieve awesome hairstyles to flaunt at the party. 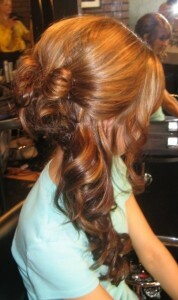 Hairstyles like French up-dos and beautiful chignons are the most popular ones for prom. You can jazz up your look by adding accessories like hair pins, fascinators and barrettes. The hair can be taken into a bunch and then scrunched up into an up-do. Using hair sprays and sweeping the hair to one side or making a one-sided braid also can glam-up the look. Hair can be styled into a variety of inspired looks like a vintage, a classic Hollywood diva or a romantic looks, giving you a certain charm and appeal. All these looks can be incorporated to style your hair for prom so that you become the star of the party.